Once you’ve decided on a second storey addition (aka first floor addition) that proportionally provides balance to your home, getting the particulars of the exterior right can make or break the aesthetic appeal of your house. Like all house renovations, careful design and planning is required when determining what techniques to apply to an exterior to highlight a home’s unique qualities and features. 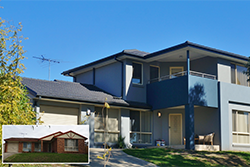 One of the simplest methods to adopt in providing a seamless finish to the exterior of your home after building a second storey addition (aka first floor addition) is through rendering the existing home. 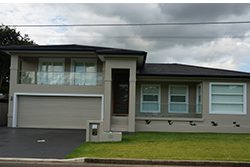 Rendering is a technique that has been popular in Europe for hundreds of years and has recently gained traction in Australia, you should always consider the impact that rendering will have on the street appeal of your home. A massively rendered frontage on some houses can look bland and reduce the appeal of your home. That is not to say that you shouldn’t proceed with rendering although you should always ask whether there are enough exterior design features, lines and depth so that your home does not lack character after applying rendering. When planning a second storey renovation one way to add character and charm to an exterior is by introducing windows that lift the overall look and feel of a home’s frontage. You may have already decided to maximize natural light in your second storey addition (aka first floor addition) through introducing large windows, although like other changes to a home’s exterior it is important to know the aesthetic limits when adopting windows as a feature to a house. Stick to windows that keep with a consistent look of your house instead of windows that stylistically clash with what you currently have. 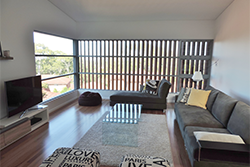 You may opt to replace the windows of your existing home so that they match the new addition. On the practical side of things, the Building Code of Australia has window regulations for openable windows as to reduce the risk of people falling, so it’s a good idea to run your ideas past us before choosing new windows for your second storey addition (aka first floor addition) to make sure they comply. Restrictions to window sizes may also apply to protect the privacy of neighbouring properties. If you want to ensure aesthetic appeal with your new addition, the key is to make sure that looks like it was part of the original design. Part of that is making sure you’re choosing paint that fits with the existing character of your home. Although what can be an intimidating exercise, you don’t need a colour consultant to get the right colour scheme. To be on the safe side, you can’t go wrong with classic colours, ones that highlight windows, doors and railings with a neutral colour for the main exterior surface. Fortunately unlike other exterior housing materials- paint can be changed from time to time if you decide to change it up down the track. You don’t have to go over the top with decorative details when enhancing the front of your home. It’s the little details that add extra interest. You can bring greater depth to your home’s frontage by adding decorative details such as window and door trims or adding shutters to windows. Consider a rustic verandah with warm wood decking or why not mix natural materials (such as wood planks) with metals and glass for a completely different feel. You really can reinvent a home both inside and out through a second storey addition (aka first floor addition). That’s why you need a professional and experienced team that have a good reputation in the market for consistent delivery and imaginative ideas so that your house stands out for all the right reasons. Get in touch with us today to discuss your second storey addition (aka first floor addition) dreams.